When buying an optical instrument, it's easy to overlook one very important feature - the coatings on the surfaces of the lenses and prisms. The difference between a magnifier or scope which gives fuzzy, double, or "haloed" images, and one which gives bright, crystal clear viewing in all types of light conditions, is very often a matter of the quality of its lens coatings. 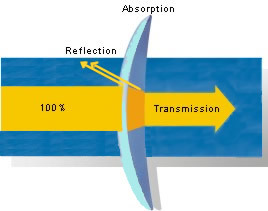 Zeiss pioneered the development of multi-layer anti-reflective coatings over 65 years ago. Today, the Zeiss T* process is the most technically advanced in the consumer optics industry, producing lenses and prisms which transmit more than 99.5% of the visible light which strikes them. What "reflections" are you talking about, and why are they a problem? Whenever a beam of light encounters a transparent pane of glass or a magnifier lens, a small fraction of the light is reflected at the surface, as if the glass were a mirror. We've all experienced this phenomenon, when we see our reflection in a plate glass store window, or are temporarily blinded by a reflection of the sun from the rear window of the vehicle ahead. Interestingly enough, there is actually one reflection from the front surface of the glass when the light enter it, and another, almost equal reflection from the far side of the glass when the light comes out again! If the light is hitting the glass straight on at a 90?angle, about 4% of the incoming light will be bounced back from the front surface, and another 4% from the back surface. If the light is striking the glass at a glancing angle, like 30?for example, the reflection can be 10% or more from each surface. Now an 8% reflection (4% from the front surface, 4% from the back) may not sound like much, but when you are looking though the lens of a magnifier, this small percentage of light, reflected from the bulb of a desk lamp for instance, can create a bright "highlight" that seems to float and move as your hand moves the magnifier. This reflection detracts significantly from your eye's ability to see the printed text or the tiny features behind the lens that you are trying to examine; in particular, it tends to interfere with the eye-brain process which allows you to keep an object in focus. If there are multiple light sources in the room - say half-a-dozen fluorescent fixtures in the ceiling - each one can create a reflected image on the surface of an uncoated magnifier lens. The result is that you will have a very difficult time seeing clearly ... which was really the whole point of using a magnifier in the first place. So what can be done about these spurious reflections? We can treat the surface of the glass or plastic to prevent most of the reflections from occurring. The first practical anti-reflective coating technology was patented by the Carl Zeiss company in 1935. It consisted of a number of super-thin layers of a metallic salt (magnesium fluoride) which are vapor deposited onto the lens surfaces in a vacuum chamber. Each layer is only about 5 millionths of an inch (14 millionths of a centimeter) thick. This stack of transparent layers, by taking advantage of the wave-like properties of light, trap the reflected light energy and redirect it back along the original path. The result is that only about one-half of one percent of the visible light is lost. Over the years, this multi-layer vapor deposition technology has been refined and perfected with new materials and more precise processes, yielding perfectly uniform, durable anti-reflective coatings for all types of personal optics. Anti-Reflective coating is a much-requested and highly appreciated feature on world-famous Zeiss spectacle lenses. In fact, all Zeiss folding pocket magnifiers, monocular telescopes, and binoculars now come standard with these trademark T* coatings. These coatings are greatly responsible for the famous image brightness and clarity of Zeiss sports optics, since every binocular has anywhere from 6 to 10 glass-to-air transitions inside, each of which would steal away a few percent of the limited light energy from the image if they were not coated with Zeiss T*. Do I need T* Anti-Reflective coating on my Zeiss handheld magnifier? As for Zeiss' line of handheld magnifying glasses, you have a choice whether to purchase the unit with or without this AR (anti-reflective) coating. If you only use a magnifying glass occasionally, and if you use it in an environment where you can control the position and brightness of the lamps or the amount of sunlight that streams in through the windows in the room, then you may not be too disturbed by these surface reflections. In this case, you might find that an uncoated lens is sufficient to meet your needs. However, if you use a magnifier constantly, to help you overcome a vision problem, or as a tool of your profession, or if you must often use a magnifier in a library, laboratory, shop, or other location where you cannot control the lighting conditions, you should definitely consider choosing the "-AR" version when ordering your Zeiss magnifier. An AR-coated lens will give you a noticeably clearer image from the moment you pick it up. Moreover, as you continue to use it over many minutes, even into several hours, you will experience more ease in viewing with much less fatigue and distraction. The bottom line is ... Zeiss Multi-Layer Anti-Reflective coating is a small investment which will pay huge dividends in viewing clarity and comfort.